IF THERE'S A more exalted educational brand than Harvard Law School, it's hard to think of it. In a public imagination fed by memoirs, novels, and movies like "The Paper Chase" and "Legally Blonde," Harvard is a colossus that bestrides the narrow legal world, gatekeeper of its highest prizes. The school's alumni include 19 Supreme Court justices, 10 US attorneys general, and countless professors and partners in top law firms. Even its least distinguished students can graduate with lucrative jobs. But for insiders, Harvard has long had a different reputation. Its critics - and even its students, grimly joking - called it "the factory," a boot camp of big classes and remote professors that funneled bright young minds into corporate legal work. The school was seen as hobbled by ideological clashes, or by its unwieldy size, or simply by ossified ideas about teaching law. Its students felt estranged; its faculty was fractious, aging, and unable to agree whom to hire or how to modernize. Perhaps most gallingly in the rivalrous, rank-obsessed Ivy League, the school sat - in the scholarly impact of its faculty, in the preferences of potential students, and in the almighty US News & World Report rankings - perennially behind number one Yale, a smaller, more selective law school that cultivated its reputation for harboring the most brilliant thinkers. Over the past five years, however, that has begun to shift dramatically. After an unprecedented hiring binge, Harvard has assembled what many legal scholars believe is the most formidable law faculty in the country, with preeminent experts in most major fields - many poached from other top schools. The percentage of accepted students who say "yes" to Harvard Law is at its highest in two decades. Surveys find students happier than at any point in recent memory, and by nearly all accounts, so is the faculty. Harvard is looking - surprisingly - nimble. And in some corners of the legal academy, there is a suggestion that it is at long last catching up to Yale. "Harvard Law School was the sleeping giant of legal education and, you know, they woke up," said Brian Leiter, a University of Chicago law professor whose widely read blog serves as a clearinghouse for legal gossip and detailed discussions of law school rankings. Behind the changes are several factors. The school's budget has swelled - this week it will announce that its most recent capital campaign, the largest in the history of legal education, has brought in well more than its $400 million goal. A late-1990s decision to shrink the size of classes created a need for more teachers. And among professors and alumni, there is near unanimity that the school's dean, Elena Kagan, a scholar of administrative law and a former Clinton administration official, has galvanized the place with her ambition and adroit management style, knitting together the faculty, charming the students, and attracting top-flight talent to the school. For the first time in years, Cambridge is home to some of the most important new voices in public law. And Harvard's rise is shaking up other top schools, creating a hiring war as they scramble to recruit new scholars. "It has unsettled things at the top of the legal academy," said Leiter. "Harvard is this giant vacuum with endless amounts of money, and it keeps sucking up more." Just as striking, though, at a place full of professional arguers and their students, is the sense of frictionlessness and good feeling that now pervades the campus. This, as much as anything, marks a stark change for a school whose august name was not always buttressed by the realities along Mass. Ave. In a university of well-proportioned quads and yards, the campus of Harvard Law School has always been a disjointed place. The layout is dominated by a massive neoclassical mesa of granite and glass named after Christopher Columbus Langdell, the 19th-century dean of the faculty who invented modern legal education. In the shadow of Langdell Hall, the rest of the classroom and administrative buildings crowd together awkwardly, bringing to mind the endgame of a disastrous round of Tetris. For much of its recent history, the school's architecture seemed symbolic of a deeper disarray. Starting in the 1980s and continuing into the 1990s, a toxic hostility divided the faculty. Harvard had become a stronghold for a radical school of thought called Critical Legal Studies. Its adherents, including Duncan Kennedy, Morton Horwitz, and Roberto Unger (all still on the faculty), held that law was simply an elaborate tool to perpetuate existing societal power relationships. This sat badly with more traditional-minded scholars like Paul Bator and Robert Clark, who defended the idea that the law could be an impartial arbiter of society's disagreements. The standoff became lore among legal academics. From a case of irreconcilable philosophical differences, things became political, personal, and - since this was academia - venomously bureaucratic. The school found itself unable to hire new professors. The feuding faculty usually couldn't agree on new hires, and those offered jobs were loath to come to what one departing professor had dubbed "the Beirut of legal education." At the same time, rival Yale, under dean Guido Calabresi, was assembling a faculty of unparalleled influence. Though much smaller, Yale Law School cherry-picked scholars who had made their names elsewhere, effectively building an all-star legal team as the factions in Cambridge bickered. The perceived gap between the schools was widened by Harvard's reputation for comparatively lax tenure requirements. Tenure had become a political rather than academic process, and a candidate with no enemies on the faculty could be promoted without having made much of a mark in the field. "Harvard was really falling behind, seriously falling behind," said Randy Barnett, a Georgetown law professor who has taught at Harvard. That hurt Harvard in the crucial contests for the top students - and, by extension, the competition to place its graduates in top firm jobs and clerkships and professorships. Though law professors and deans tend to dismiss rankings as subjective and oversimplified, even the most high-minded deans have no choice but to think about how they stack up against their competitors, said Theodore Seto, a professor at Loyola Law School who has studied the inner workings of the US News ranking system. "Their core constituencies think about [rankings] a lot: prospective students and faculty and most importantly the alumni, who yell and scream at incredibly high volume," said Seto. "At Harvard the alumni elect the board, and of course alumni are the source of your donations." The open feuding on Harvard's faculty ended in the early 1990s, but it cast a long shadow, and the next decade was largely a matter of repairing the damage. Clark, a controversial pick for dean in 1989, is credited with doing much to ease tensions. The school gradually started hiring again, and Clark proved a talented fund-raiser. Still, there was a sense among faculty members that the school had become a cautious place. "[Clark] helped us move from a phase of more overt difficulties to calm," said Martha Minow, a longtime professor, "but largely at the cost of innovation." Larry Summers shared that view. When he took over the presidency of the university in 2001, one of the many things he wanted to shake up was the law school, which he saw as underachieving. "Despite having enormously able people, it was less than the sum of its parts in terms of its impact on students, its impact on legal thought," he said in an interview for this story. At the time, he complained publicly about the school's "idiosyncratic" tenure choices and what he saw as its intellectual complacency. His choice for a dean to succeed Clark was in certain ways a surprising one. Elena Kagan had graduated from the law school, but had taught there for only a few years - a relative outsider in a school that values its traditions. She had arrived at Harvard in 1999 after consecutive stints as a White House lawyer and then domestic policy adviser in the Clinton administration. Kagan had impressed Summers with a report weighing the case for moving the law school to the university's planned Allston campus - in the end she recommended against it - and impressed him further in conversations about the school's future. "I thought she had a combination of commitment to students, leadership ability, and deep insight into law, not just for its own sake but as a tool for making the world work better," he said. Kagan set to work early, making small but visible changes to improve the everyday lives of students. She started providing free coffee in classroom buildings, and free tampons in the women's bathrooms. On a lawn outside the student center, she added a beach volleyball court that doubled, during the long Cambridge winter, as a skating rink. According to several of her former students, this emphasis on creature comforts came as something of a surprise - she was, they recall, a clear and enthusiastic teacher, but an unforgiving one as well, known for angrily dressing down students who came to class unprepared. For her part, Kagan describes that early flurry of face lifts and new perks as an idea borrowed from her former boss, Bill Clinton: The faith that small, symbolic policies could help solve big problems. "When I got here I looked around for little things I could do: things that don't cost much money, don't take much time, that you don't have to have a faculty meeting to do," she said in an interview in her office. "As it turns out," she said with a slight laugh, "you can buy more student happiness per dollar by giving people free coffee than anything else I've discovered." On the broadest level, Kagan's governing philosophy seems to be one of persistent experimentation, of making the school more open to innovation and change. "Before, every possible change had to be weighed against hundreds of years of illustrious history. Now changes are weighed by asking whether it might make something better," said Elizabeth Warren, a bankruptcy law professor who chairs the school's admissions committee. The school has greatly expanded the number of legal "clinics" where students can get courtroom experience while still in school, and the required curriculum is in the midst of a fundamental reinvention. A new $150 million building is under construction at the campus's northwest corner. This spring the school introduced a program that would waive third-year tuition for all students who commit to at least five years of working in the public sector. And last month it announced that it was moving from letter grades to a pass-fail system like Yale's and Stanford's. For students, all of this has paid off: The last five years have shown significant improvement in the survey scores that graduating students give the school for factors like "sense of community," "overall educational experience," and "overall quality of life." Where Harvard has drawn the most attention, however, is with its hires. In part, this is simply a matter of size: the school's already large full-time faculty has grown, under Kagan, from 80 to more than 100. But it is also a testament to the sort of talent the school has attracted. Despite the presence at Harvard of legendary constitutional scholars like Laurence Tribe and Frank Michelman, until recently there was a sense of a certain intellectual lopsidedness. The faculty had become geared toward the study of private law - and in particular corporate law - rather than public law, where scholars critique and sometimes shape the legal underpinnings of US domestic and foreign policy. Perhaps fittingly for a former White House adviser, Kagan has helped bring in a new wave of young, high-profile public law scholars. Among them are Jack Goldsmith, a former Bush White House lawyer and leading skeptic of international law, and John Manning, an administrative law expert and constitutional scholar of the "textualist" school. Both hires have helped assuage complaints that Harvard marginalized conservative views. Another new hire, Adrian Vermeule, who has argued for radically reducing the role of the Supreme Court, is often grouped with the conservatives. Also joining Harvard under Kagan have been Noah Feldman, whose writings on the law and religion - especially Islam - have made him one of country's most famous legal academics; Yochai Benkler, a leading intellectual property and cyberlaw expert; and Jody Freeman, a prominent environmental law scholar. Perhaps the biggest hire came this February, when Kagan announced that Harvard had hired Cass Sunstein, the University of Chicago scholar whose work has shaped broad swathes of the intellectual landscape, on topics from the Supreme Court to the environment to Internet regulation to behavioral economics. In announcing that Sunstein would be coming to Harvard this fall, Kagan called him "the preeminent legal scholar of our time." Sunstein had his own reasons for coming to Cambridge - this summer he married Samantha Power, the human-rights scholar and author who works at Harvard's Kennedy School of Government - but the overall wave of hires would have been impossible without Kagan, say many professors. To an unprecedented extent, she has taken control of the hiring process, talking with almost every member of the faculty before votes on appointments, consulting and cajoling and counting votes. "She has seized the power to appoint, and used it very effectively," said David Kennedy, a professor at Harvard Law who also holds a professorship at Brown University. 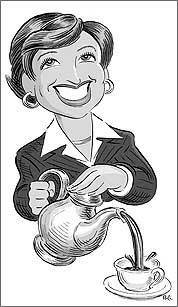 Kagan showed her willingness to impose herself early in her tenure. In 2004, Goldsmith's proposed hiring triggered a powerful backlash: He had served in the Bush administration under John Ashcroft, and his opponents on the faculty questioned whether he had helped author the Bush administration's "torture memos" (as it turned out, he had not). In the past, a small and determined faction could probably have derailed such a hire. Kagan, however, threw her weight strongly behind Goldsmith, and made sure his appointment came to a vote. In the end, it was approved by a wide margin over the objections of his opponents. That broke a precedent, said Detlev Vagts, one of the professors who opposed the hire: "In the old days we didn't hire people against substantial opposition within the specialty," he said. With the logjam effectively broken, the school has gone on an epic shopping spree for talent. According to Kagan, it's not going to end any time soon: The school has an offer out, among several others, to Stanford's Lawrence Lessig, perhaps the country's leading expert in the law of cyberspace. And its success has shaken things up for the nation's other top law schools, Yale, Stanford, Columbia, Chicago, and NYU. In the back and forth, Yale has in recent years hired away two of Harvard's young stars, Christine Jolls and Heather Gerken, and hired two other scholars Harvard was pursuing. NYU managed to lure the legal philosopher Jeremy Waldron away from Columbia. But most of the high-profile moves in recent years have gone Harvard's way. And as they do, other top schools are scrambling to fill the open spots. Now Columbia, like Harvard, has embarked on an expansion of its faculty, promising further jostling at the top. Yale, meanwhile, is still ranked number one in the US News rankings. But like Harvard 10 years ago, it has, to some extent, been graying in place: nearly half its professors - including some of its best known - are now over the age of 60. And campus conservatives there, pointing to some of Harvard's hires, are complaining anew about the liberal bent of their school's faculty. Kagan's success hasn't been unnoticed by a university excited to have its law school once again preeminent. A gleeful April Fools' satire in the law school newspaper carried the headline "Dean Kagan Hires Every Law Professor in the Country." And one measure of Kagan's success has been that, when Summers was ousted as Harvard's president in 2006, Kagan was one of the top choices to succeed him. When she didn't get the job, students at the law school held an impromptu party for her. Around 600 came, and T-shirts saying "I [heart] Elena" were made up for the occasion. "There was just this sense of relief that she was not going to leave the law school," said Laurence Tribe. "It's inconceivable to me that in any other time I've been here that there would be something like that," he said. Drake Bennett is the staff writer for Ideas. E-mail drbennett@globe.com.